“Skyscraper” is bound to be compared to 1988’s first-rate Bruce Willis-starrer “Die Hard,” and it’s not hard to see why, but it’s more comfortably familiar than an outright rip-off. Like Willis' John McClane, Dwayne Johnson plays a man trying to save his family out of a high-rise populated by terrorists, only this time he’s an amputee and the titular skyscraper is a towering inferno. There’s never any doubt that the brawny protagonist and his family will get out of this sticky (and fiery) situation alive, and that CGI/green screen gives a vast assist, but the getting-there is full of perilously overblown situations that are mounted with palm-sweating, vertigo-inducing excitement and seamless stunt work. Lest anyone is buying a ticket for a crowd-pleasing B-movie to think real hard or to not hear a lot of expository dialogue, “Skyscraper” is a purely entertaining Dwayne Johnson vehicle tailor-made for the summer movie season; it isn't aiming to be rocket science or a documentary. 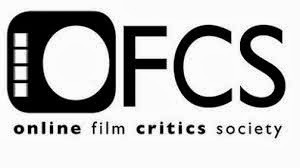 Its greatest ambition is to thrill, and it quite skillfully delivers on that count in spades. Ten years after an explosive hostage situation that lost him his left leg below the knee, Will Sawyer (Dwayne Johnson) is a Marine and FBI agent turned security consultant with a prosthetic leg. His latest job has taken him and wife Sarah (Neve Campbell), the Naval surgeon who saved his life, along with their twins Henry (Noah Cottrell) and Georgia (McKenna Roberts), to Hong Kong, thanks to a referral by former FBI Hostage Team member Ben (Pablo Schreiber). Before its residential opening, Will must analyze The Pearl, a gleaming, technologically advanced skyscraper, created by billionaire tech magnet Zhao Long Ji (Chin Han) that stands 225 stories tall like its own vertical city. On that same day, the tablet controlling The Pearl’s mainframe and its anti-fire systems is stolen from Will, while a crew of terrorists, led by the vengeful Kores Botha (Roland Møller), unleash flammable chemicals inside the building. When the 96th floor is engulfed in flames, it is directly below the residential suite, trapping the Sawyer family and leaving Will as the one-man army to go and save them. 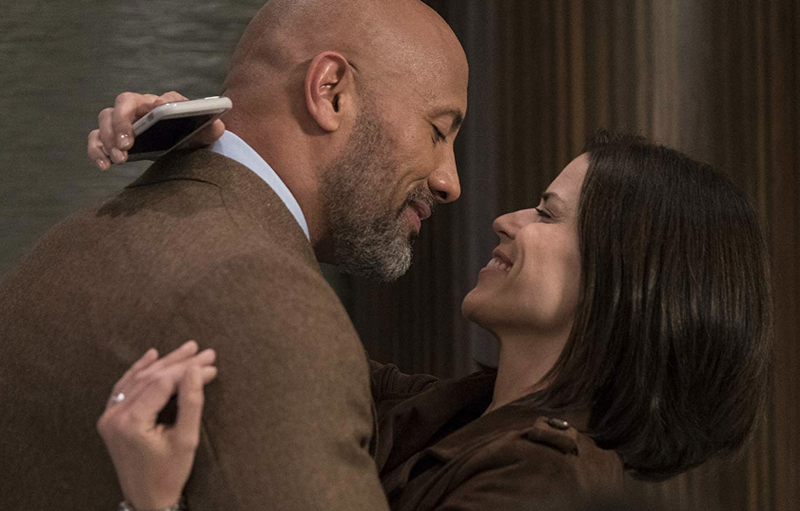 Writer-director Rawson Marshall Thurber (2016’s “Central Intelligence”) knows “Skyscraper” is a check-your-brain-at-the-door action picture that’s larger-than-life, over-the-top and unable to ace a plausibility test. There aren’t many surprises, either, but in the name of derring-do, Thurber finds an easy thrill in dangling his star from high places and having him leap across precarious chasms, and it’s effective every time. Even though Dwayne Johnson isn’t actually climbing a crane elevator 2,000 feet from the ground, scaling a narrow ledge to reach a control panel behind a turbine, or hanging upside down only by his prosthetic leg, audiences will get an adrenaline rush, clenching their armrests anyway, while acrophobics will try hard not to look away. It’s about as hairy as Tom Cruise scaling Dubai’s Burj Khalifa building in “Mission: Impossible - Ghost Protocol,” only stretched across several set-pieces. 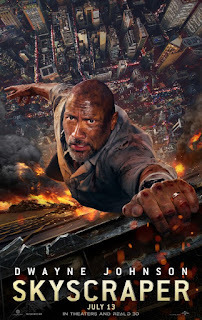 Coinciding with “San Andreas” and “Rampage” before this, Dwayne Johnson stands firmly in disaster-movie savior mode here without getting the chance to play up his charming, funny persona too much. Even as Will Sawyer, he's a believable family man, doing what he does well and still having charisma for days. The most vulnerability Will has comes from his prosthetic leg, which the filmmakers at least have the sense to have Will use it to beat someone and to hold open a closing door. Working in TV but not seen on screen in a high-profile project since 2011’s “Scream 4,” Neve Campbell makes a game comeback in not playing wife Sarah Sawyer as a passive, helpless victim who stands back and waits for her muscle-bound knight. It could be a thankless role, but Campbell makes Sarah resourceful, intelligent, assertive and proactive, and as it should be, she gets much more to do (by speaking Chinese, Sarah can understand the Hong Kong police discussing their suspicions that Will might be involved with the starting of the fire) and enough badass moments of her own. Taking itself seriously enough but handled with dabs of humor that don't displace the stakes, “Skyscraper” efficiently runs through its plot mechanics and double-crossing twists before getting to the set-pieces. What the bad guys want is an afterthought of a McGuffin, and where the film needed a Hans Gruber, the bad guys here are either generically bad as can be or generic turncoats. There is, however, a tightly edited and well-choreographed hand-to-hand fight in a kitchen before Will even gets to the skyscraper, and there are amusing payoffs to setups involving Will rebooting Sarah’s iPhone and The Pearl’s house-of-mirrors holodeck-like dome. Those who call “preposterous” as soon as Will takes the jump from a crane to a broken window above the fireline in the burning skyscraper will miss out on the fun that “Skyscraper” has to offer. Credibility might not always be its strong suit, but then again, just in April, Dwayne Johnson played an ex-Special Forces turned primatologist battling genetically enhanced, havoc-wreaking animals, and that was fun, too.